In a deal with implications for automotive refinishing customers, Sherwin-Williams announced Sunday it would buy Valspar for $11.3 billion. 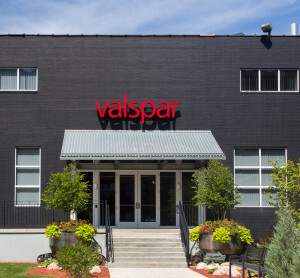 Both board have approved the deal, which pays $113, a 41 percent markup, for Valspar shares. Ironically, the $11.3 billion purchase price is the size of what Allied Market Research estimated the entire global automotive refinishing market would be worth by 2021. “Sherwin-Williams and Valspar have highly complementary paints and coatings offerings and this combination enhances Sherwin-Williams position as a premier global paints and coatings provider,” Sherwin-Williams wrote in a news release. Had the two companies been combined in 2015, they’d have had about $15.6 billion in revenue, $2.8 billion in EBITDA and 58,000 employees. Besides the obvious elimination of competition and a greater market share across all coatings lines, Sherwin-Williams estimated the major benefits would be a greater presence abroad, more packaging and coil offerings and ultimately $320 million a year cut through greater efficiency. Sherwin-Williams’s auto refinishing offerings include the ATX, AWX, Dimension, Premium and Ultra7000 lines. Besides the obvious Valspar Refinish, Valspar’s lines include DeBeer Refinish, House of Kolor, Matrix and Prospray. Both companies said customers should benefit customers, with Sherwin-Williams’ CEO John Morikis citing “cost syergies.” This could include greater deals on both product lines post-merger (expenses to produce and deliver both should fall) streamlined delivery (you would only have to wait for one truck), and the benefits of education and loyalty programs. The deal should close in the first quarter of 2017, so long as shareholders and U.S. and international regulators approve — always a question when two very similar companies combine. “Both companies believe that the combination will benefit customers and that it will receive all necessary regulatory clearances,” Sherwin-Williams wrote. Still, the companies have a Plan B should regulators could prevent Sherwin-Williams from keeping all of Valspar. Should the “unlikely event” that regulators force the divestiture of more than $650 million worth of Valspar business lines, Sherwin-Williams will only pay $105 a share. If more than $1.5 billion in Valspar business can’t be acquired, Sherwin-Williams will kill the deal.